Crumbs | Eat It, Damn It! Cupcakes have become all the rage. More appropriately, they’ve been all the rage for quite a while, it’s only now that I’m writing a review. Crumbs is a pretty popular chain with locations on the east and west coast. I originally tried out a location in Manhattan after leaving the Museum of Modern Art. This particular review is of the Westport location. As far as I remember, quality control is pretty even across locations (as is not always the case with chains). I was having dinner with my girlfriend and her parents and thought I would bring an assortment for dessert. My girlfriend’s father has Celiac Disease, so he cannot eat anything with gluten. Long and short, he should not eat anything with white flour (and some other stuff). I thought a large chain like Crumbs would have a few gluten-free products, but surprisingly, they had nothing. Oh well, it wasn’t for lack of trying. I got an assortment of four cupcakes. Crumbs gives names to all their cakes, sometimes in homage of people that love the flavors. 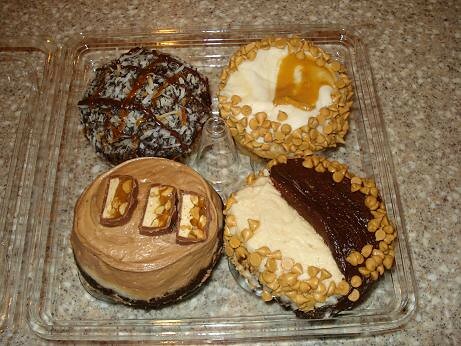 From top left: Samoa, Elvis, Baba Booey, and Caramel Crunch. I’ve had the Baba Booey a few times before and it was just as I remembered, sheer and utter decadence. 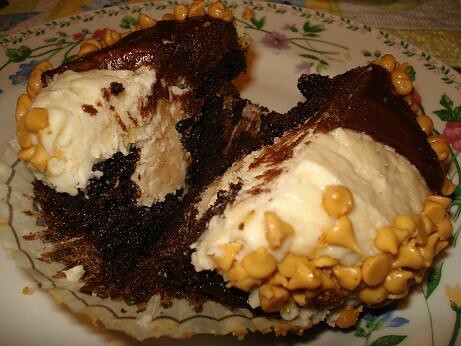 It is a chocolate cake, chocolate frosting, peanut butter frosting, peanut butter filling, and peanut butter chips. As you can guess, I’m a fan of peanut butter. It is sweet, mind-bendingly, pucker your face sweet. There is very little subtlety with this treat. I would recommend it for people that love eclairs, cheesecake, and pasty cream. The Elvis was surprisingly light. 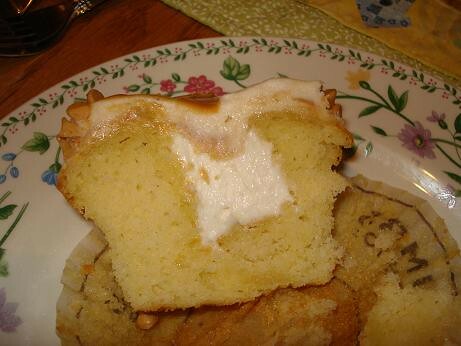 It was a white cake with banana frosting and peanut butter chips. There was no bacon. The Caramel Crunch and Samoa were also good, but don’t ask for a description. I was so overwhelmed by the others that I couldn’t give a good summary of the flavors. I could not imagine eating one of these cupcakes by myself. They are incredibly sweet and rich. I recommend sharing with at least one other person.